Singer's broadside history reminds us that the population of Chelm consists of no one but fools, and they've known nothing but trouble ever since Gronam Ox, first ruler and Sage of Sages, invented the word crisis. 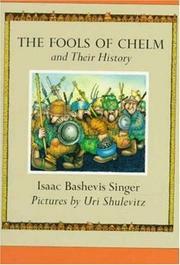 Chelm is then perceived to be So badly off that the council of sages (Dopey, Numskull, etc.) agrees that only a war can save the village, and though the soldiers end up invading the wrong town, never mind: "The truth is, the whole world considers us fools. No matter whom we attack, it will be exactly what they deserve." Instead it's the invaders who get what they deserve, and as "a lost war sooner or later is followed by a revolution, that is what happened in Chelm." But the rebel's decree against money only aggravates the discontent and confusion, so Feitel the thief takes over -- only to be replaced, when his policies lead to further disaster, by Gronam and the sages back from exile. At last the Women's Party, led by Gronam's wife Yente Pesha, decides to run the government while the men do the dishes -- "but Gronam remains optimistic: 'The future is bright. The chances are good that some day the whole world will be one great Chelm!'" Shulevitz' view of all parties -- the gaping, head-scratching sages, the toothless, club-waving mob, Feitel's sinister thugs with cigarettes dangling from their mouths, and the orating yentes wielding rolling pins -- is as consistently dim as Singer's; the Chelmites' universal uncomeliness in both pictures and action is relieved only by the ludicrous extent of the caricature.